Richelle Martin is the 2018 recipient of the Charles Labatiuk Scholarship Award, and this fall, will be pursuing a Law Degree at the University of Ottawa. With this degree, Richelle hopes to use law as a tool to have a more meaningful impact in the field, and to strengthen her ability as an environmental advocate. While pursuing this degree is her first foray into the world of environmental law, Richelle’s journey as an environmental advocate is well underway. Having worked with the Nature Trust of New-Brunswick for the past six years, Richelle has been actively using her voice to protect nature in Canada for some time. In her position at the Nature Trust, she was responsible for the management of 50 nature preserves across the Province and the facilitation of community involvement in volunteer land stewardship. From there, the conservation of nature and diversity of living things became the driving force for the path that she has chosen in life. Richelle on Spednic Lake, New Brunswick. Richelle noted how important this scholarship was, and how it is a key piece of the puzzle to help finance her education, and remain an active environmental advocate. 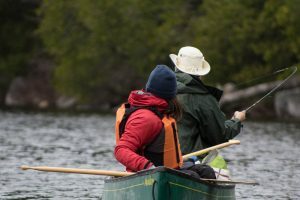 This support will award her with more time to become involved in volunteer work and activities in environmental law, applying what she is learning to the conservation of nature in Canada. Looking beyond her next few years of studies, Richelle hopes to use her degree to work with both NGOs and government to develop stronger environmental laws and policies that protect biodiversity and ensure future generations’ access to a healthy environment. She also shared that she sees herself as an educator, with part of her role as a lawyer being to educate the public on their rights, and in empowering grassroots community organizations and people with the power of the law. By empowering grassroots community groups and people, we will be able to use the power of the law to better hold law breakers accountable for harm to the environment.